How did the turbine connect to the dam? 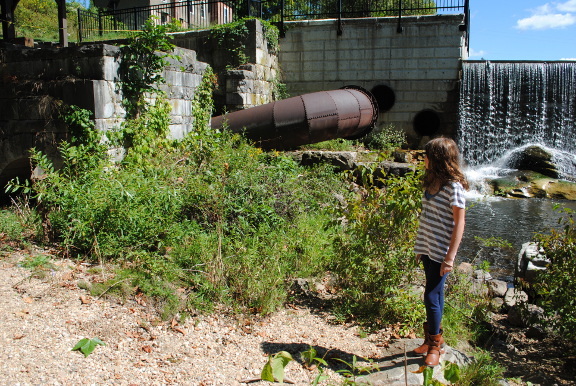 In the photo, you can see holes in the dam where this penstock connected — or did it? Research — and old photographs — reveal that the penstock did NOT connect directly to the dam! Instead, it connected to a wooden water chest that was mounted on the face of the dam. (the water chest is long gone, and was long gone before the dam was reconstructed a few years ago). While we don’t know exactly why the water chest was used, we suspect that it had to do with further controlling the flow of the water. While there was a valve on the dam to control the flow through the pipe that ultimately fed the penstock, we think that possibly both holes in the dam could have fed the water chest, thus providing the ability to fill it more rapidly. But the fact is that we don’t know!